Today’s post can transform your quiet time while you help provide the Vidunda people with a Bible in their own language. Welcome my guest Lara Williams. She and my friend Katie Orr have written an encouraging and practical quiet time guide titled “Savoring Living Water: How to Have an Effective Quiet Time.” It is more than worth the price and your time. (Here’s my 2011 review.) 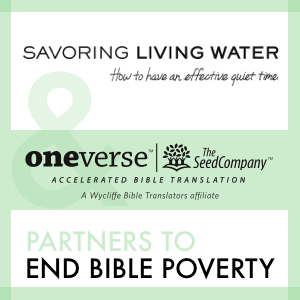 If you buy the e-book today, you also have the extra blessing of helping people around the world have the Bible translated into their language! Read on! Really looking at what’s going on in the world at large can make me…uncomfortable. It’s much easier to just sit in my cozy house with my iTechnology while eating all my favorite foods that I picked up at the choice-satiated grocery store rather than really looking at the world. But I’m glad that’s not what Jesus did. I’m so thankful our God didn’t leave us in our selfish mess, but rather bent down and clothed Himself with humanity to make a way for us to truly live. It’s radical grace. But if I’m not purposeful, I can get comfortable in plentiful. I can forget what it’s like to be separated from God — in the dark. So today I’m going to remind us. Well, not just remind us and leave us in a pit of guilt, I have something we can tangibly *do* in an effort to help bring light and life to those who have never read of their Maker. Katie Orr and I wrote a little book called Savoring Living Water: How to Have an Effective Quiet Time. In the process of writing that book, God reminded us of the hundreds of thousands of people around the world who do not have a single verse of Scripture in their language. The realization floored us. So we asked Him what we could do to help. And He led us to OneVerse. To make a long story short, He led us to give $2 from the sale of every copy of Savoring Living Water to OneVerse, specifically for the translation of the Bible in the Vidunda language. Every $26 funded another verse for the Vidunda people. We’re excited to report that we are SO close to reaching our original goal of funding 104 verses. In fact since the launch of the book last Fall we’ve raised almost $2300 towards the Vidunda project — that’s over 88 verses! With the goal being within arm’s reach, we want to have a final push TODAY. So for today only, $5 from the sale of every e-copy will go directly to this Vidunda project. That means if we can sell 82 e-copies of the book today, we will reach our goal! You or I may not be able to leave our homes or families to go study languages and translate the Bible for a people that’s never read the name “Jesus.” But we can buy a book. And we can pray that God would bring His Word to the nations.